Please remember to have your garbage and recycling bins at the curb no later than 6:00AM on Tuesdays. Thank you! Garbage and recycling service is contracted to Advanced Disposal Services. 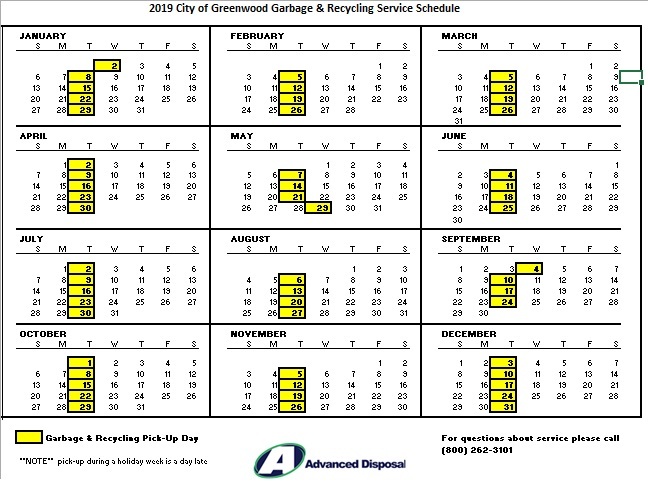 The City of Greenwood has an outstanding recycling program. This is due to the good work of the residents. Recycling takes time, but it's well worth the effort. Recycling bins are available at City Hall. 35, 65, and 95-gallon garbage carts may also be ordered at City Hall. There is a monthly cost associated with the cart, which will be added to your garbage/recycling bill. It shall be unlawful for any person, unless under contract with the City of Greenwood or unless said person receives permission from the Director of Public Works, to remove any recyclables as defined in section 8-3-7 which have been placed in the approved recycling bin and placed at the street or alley for collection. First offense will e a written warning. For second and subsequent offenses, a forfeiture of not less than $10,00 or more than $50.00, plus costs, shall be imposed.